Here is a great picture of what we will call Ali's swarm (pictured left). Ali called me about 8:30 last night. I think that after talking to her for about 1/2 an hour she wished that she had call Ozarks Honey Company first. She was a bit set back by the other beekeepers that she had already spoken to. Thank God that she had not given up on the idea of saving the bees all together. The previous beekeepers had given her some sadly wrong information and tried to charge her an outrageous fee to come rescue her swarm. I think the first beekeeper tried to scare her into having him come out by telling her that she probably had africanized bees. This is just plain wrong for a beekeeper in the Springfield area to tell anyone just to go get a swarm. A quick look at this map: http://www.ars.usda.gov/Research/docs.htm?docid=11059&page=6 should quickly dispel any one who thinks that we have africanized bees in any Missouri county. I am not sure if this beekeeper was simply uniformed or just trying to make sure that Ali had him come and get the bees. The second keeper she spoke with told her that it was going to cost her $200 for him to come out and get the swarm. Seriously??? I can not even believe that. I have heard of some beekeepers asking for some gas money if the travel was far for them, but $200... OMG! That's nuts! 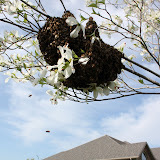 At the Ozarks Honey Company we NEVER charge to come and get a swarm. We always promise fast, free bee swarm removal. If we can't come get your bees for any reason, we will always tell you up front and do our best to find you a resource to help. So, here we are this morning, I had already decided that Jeff Maddox was going to get these bees. I simply am out of equipment at the moment and Jeff is needing the bees, plus there is also a hive in the walls of Ali's house. So, the two together make it a good fit for him. Jeff called me a little after 8:00am and informed me that he had already gotten two other swarm calls this morning. Geez, must be the weather... 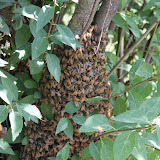 So, I catch up with Jeff in south Springfield, helping rescue a beekeepers own swarm from a tree right above her hives. After rescuing her bees from the cold day, we were off to get Ali's swarm and diagnose how difficult it is going to be to remove the hive. Captured the swarm on the north side of Springfield in Green County, Missouri with relative ease. The news for the homeowner on the swarm was not quite as good. The bees were definitely in the walls of the house and would require extraction. Jeff was able to provide them with a suitable alternative to ripping the side off the house in that he could go to get the bees from the inside. This seemed like an amicable solution to the unfortunate situation. So, here is the recap... Three swarm calls and one with a hive in the wall too. As they say, when it rains... It pours. Trust me that is not a complaint, we love to rescue bee swarms.